It is not enough for hotel lobbies to simply welcome guests. Today they are changing from a place of passage to a space that encourages people to linger, share and meet, to work, eat and relax, in short a place to stop and stay while. While these changes remain a thing of the future for many hoteliers, particularly independent, chains are gradually taking action. Evolving at the rate of socio-cultural developments, technological progress and environmental factors, hotel design is constantly re-evaluated. The hotel lobby lies at the heart of this movement, adapting to the development of electronic check-ins and new behavior and customer expectations. Spaces are reinvented under the attentive gaze of design professionals and architects. Gérard Laizé, general manager of VIA (Valorisation de l'Innovation dans l'Ameublement), offers an overview of market trends: "As far as lobbies go, there are currently two concerns: a general exasperation with welcoming guests like bank tellers, a desire to offer a warmer welcome and a will for speed and efficiency. There are also more intimate corners where there is privacy for conversation, especially with big, broad backed armchairs." Today, lobbies are more open and no longer just for reception. "We can invite clients to snack or eat in the lobby. Purposes are hybridized and restaurants are not just for dining as the lobby is not just for reception and check out," declared the interior designer Marc Hertrich in an interview with Hospitality ON. A survey of French professionals reveals a new awareness of the sector and these new trends. 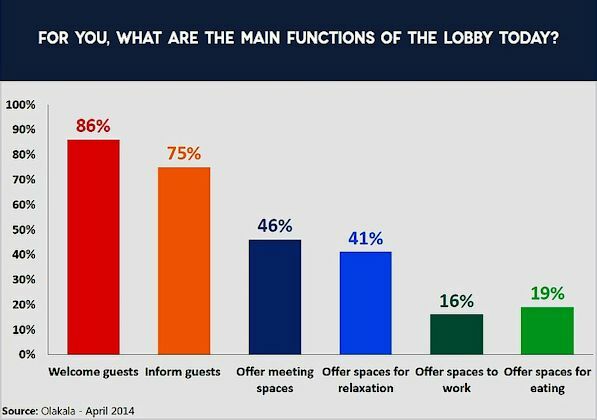 While most of those surveyed say the primary functions of lobbies clearly remain welcoming clients (86%) and providing them with information (75%), 46% also mentioned meetings, 41% relaxation, 19% catering and 16% work. Several hotel chains have already revised their concept of the lobby, reflecting the latest technological, social and environmental evolutions. With Open Lobby, Holiday Inn blends types and combines lobby, restaurant, bar, salon and business center in an open and coherent space, while refreshing the design to give it a more contemporary appearance. To create the concept, the chain studied the way people used space in their own homes and the conclusions of a new survey of travel perspectives by IHG that shows the emergence of a new generation of business travelers who have shipfted away from the constraints and routines of work associated with traditional offices and prefer to meet other travelers while they work on their own portable computers and smartphones. Le Méridien also recently presented a new lobby concept. Called "Méridien Hub", it reinterprets these spaces as meeting spaces that stimulate conversation and arouse curiosity in an artsy designer environment. They have three areas: "Arrival Experience", based on the principal that the first ten minutes in a hotel determine the overall experience; "Interaction zone", designed as a living room with armchairs and a bookcase; and the "Latitude Bar" with a bar and catering offering as inspiration for creativity. Mercure is also following the social trend and has reinvented its "welcome" experience by transforming its reception area into an open space that is intended to be friendly. This approach is based on the friendlier and easier interaction that transforms receptionists into hosts. It is transformed into gust tables that personnel and customers clients may share depending on their needs and provides digital tablets for an easy arrival and to encourage dialogue. 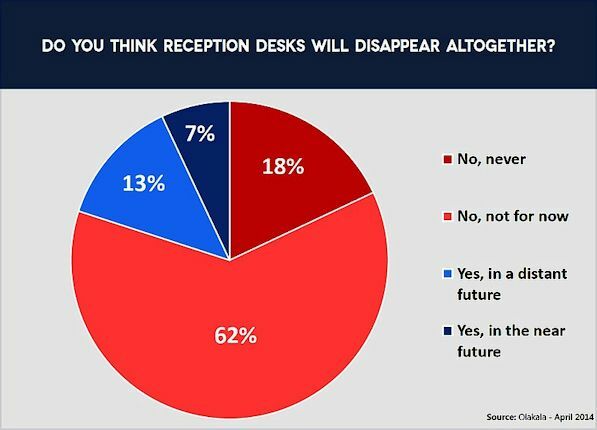 While reception becomes one of many functions of lobbies, the question remains about the disappearance of traditional reception desks. According to Gérard Laizé, "Reception desks are becoming obsolete, particularly with the arrival of check-in by mobile phone which makes it possible to check in from rooms. They have no reason to exist anymore." The disappearance of desks is however, not considered an urgent matter for 80% of the sector's professionals however, as results of a survey by Hospitality ON show. Nonetheless there is a significant nuance: 62% of those who answered the survey remarked that their disappearance should not happen "for now"; only 18% consider believe that in the long term their presence will remain under the current conditions. Born in 2011, the Hospitality-ON® magazine and Hospitaltiy-ON.com website are both taking part in the direct extension of HTR (Hotel, Tourism & Restaurant), which was created in 1994, in the Hôtel Restau Habo newspaper created in 2000, and their respective sites. Powered by the work of a bilingual editorial team, Hospitality-ON is available in French and English to find the news and to analyze all facets (aspects) of the French, European and global hospitality industry.